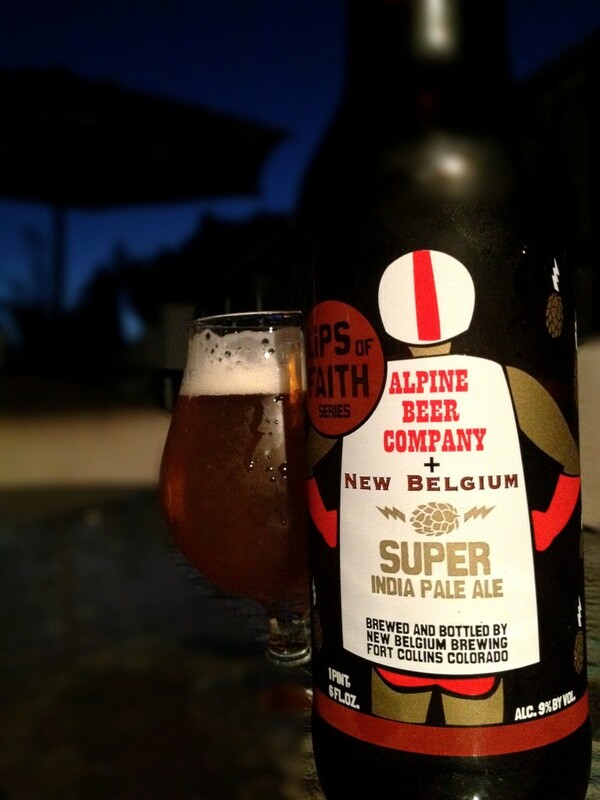 Posted by Jeff Hammett in alpine beer co., beer reviews, beer stores, bine and vine, breweries, new belgium brewing co.
As a San Diego hophead I recognize that Alpine Beer Co. makes some of the best IPA’s in the world. Despite how infrequently Alpine’s beers show up at local bars and bottle shops, we’re pretty damn spoiled with the fact that the brewery is a short 30 minute drive from San Diego, where we can buy bottles and fill growlers five days a week. Alpine has extremely limited distribution outside of their own brewery and pub, I’ve heard there are a few shops in the LA area that occasionally get Alpine’s beer (legitimately from an actual distributor, there are many more shops around the state that buy beer at Alpine and then resell it, a process frowned upon by the brewery) but for the most part if you want to drink Alpine’s beers you have to be in San Diego (and maybe even drive up to Alpine). The fact that their beer is so good, and so hard to come by outside of our small corner of the country has caused quite a bit of demand amongst beer geeks out there. Demand that just cannot be filled by Alpine’s rather small brewery. So when I learned that Alpine Beer Co.’s Pat and Shawn Mcilhenney were headed to Fort Collins to brew an Alpine style Double IPA in collaboration with New Belgium Brewing Company I was certainly excited for the beer itself, but recognized this might be a much bigger deal to those folks within New Belgium’s wide distribution area but outside of Southern California. A whole lot of people are about to be exposed to Alpine Beer Company, many probably for the first time. Thankfully Super India Pale Ale is superb beer and even though it wasn’t brewed in Alpine, CA it’s well deserving of having Alpine’s name attached to it. I picked up a bottle of Super IPA at Bine and Vine (which I hadn’t been to in a month or so, I have to say it’s looking pretty nice in there) last night for $6.99, I think I saw them tweet that they’re now sold out but are expecting more next week. New Belgium brewed a lot of this beer, 1400 barrels according to one of Alpine’s past email newsletters, which they state is almost equal to Alpine Beer Co.’s entire annual production, but demand is expectantly high. It’s all over town, but may take a bit of searching to find, especially at some of the more popular beer spots. Super IPA is everything you would expect from an Alpine IPA, big and hoppy. Without having drank the two side by side (so this may not be an accurate comparison) it reminded me a bit of a bigger version of Duet. Quite a bit of citrus and pine hop flavors supported by a malt backbone that doesn’t get in the way of the hops. It comes in at 9% ABV but it’s not overly sweet or too boozy. Super IPA is delicious, but I don’t know that it’s any better than other Alpine IPAs/Double IPAs (in fact my tastebuds are still loyal to Nelson). So while I hope to drink a few more of these while they’re around, once this one-off beer is gone I’ll go back to drinking Nelson, Duet and Pure Hoppiness and have no complaints. But for those beer drinkers that aren’t as lucky to be able to pick up beer’s from Alpine regularly, this is indeed a special treat. And as a side note, I think this might be one of the coolest beer bottles I’ve ever bought. I don’t save too many bottles, but this one is a keeper. I say not quite San Diego brewed because Butcher’s Brewing is currently contract brewing their beers at other locations (including Irvine’s Bayhawk) while they are working towards opening their own brewery in Carlsbad. Butcher’s Brewing is the brainchild of Rey Knight, formerly of Knight Salumi Co. I talked to Knight at Bottlecraft a few weeks ago for the Free Range IPA release and one thing that stood out was the fact that he wasn’t shy about the beer being contract brewed for now. In my opinion there’s nothing inherently wrong about contract brewed beers, it’s when companies try to hide the fact that their beer is contract brewed that bothers me. Knight told me where the beer was made (they use two different facilities) and told me about his plans to open their own brewery here in San Diego County. Free Range IPA isn’t a perfect beer, but it’s a great start from such a young brewery. The 7% ABV beer is hoppy with that sweet tropical fruit smell and flavor of Nelon Sauvin hops. Free Range IPA also uses Summit hops, which some people perceive as smelling and tasting like garlic or onions, but I don’t get any of that from this beer. It’s hoppy, but not a total hop bomb, there’s a bit of toasty malt, not overly sweet but it’s there. I prefer a more dry, totally hop forward, hop bomb of an IPA, which this isn’t, but it’s not bad and isn’t a bad start. 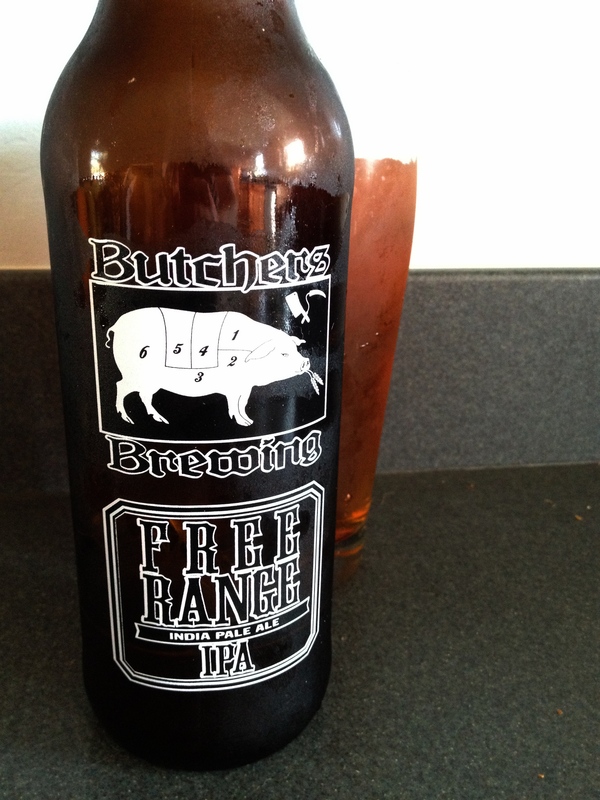 Free Range IPA is worth trying, but it may be hard for them to compete in such a crowded market. I paid $8.59 for this 22oz bottle at Bine and Vine, which is around the same price (or even more expensive) than other tried and true IPAs and Double IPAs like Alpine’s Nelson, Ballast Point’s Sculpin or Port Brewing’s Mongo. (This problem of pricing isn’t unique to Butcher’s Brewing, it’s a problem many new breweries face). This is one style of beer where Butcher’s will have plenty of competition, but this isn’t a bad start. Free Range IPA might not be my favorite IPA, but I’ll certainly drink it again. I try to do most of my beer shopping at small, locally owned shops; places like Bottlecraft, Bine and Vine, Olive Tree Market and (though I don’t stop in nearly enough because the location isn’t very convenient for me) Best Damn Beer Shop. Places where I can be fairly confident that the beer turns over with some regularity and isn’t sitting around on the shelves for months at a time. But every once in a while I find myself near a BevMo and decide to stop in to see what they have. Yesterday I was near BevMo in La Mesa and went in to check out the selection. While browsing the beer aisles I came across Widmer Brothers Nelson Imperial IPA, a beer I’ve heard good things about but have never had. A four pack of 12oz bottles was around $8 and the 22oz bombers were selling for around $4.50. I decided to get the 22oz, picked one up and kept browsing. When I was nearly done and about to pay I l looked at the label again and noticed the date code on the bottle. This beer had been bottled in August of 2011 and had been presumably sitting out on the warm shelves of BevMo ever since. Widmer Brothers describes Nelson Imperial IPA as having “a powerful hoppy character” but at 7+ months of sitting around on warm shelves I decided to skip it. I checked the four pack, which showed those beers had been bottled in February which seemed much more reasonable, though not being refrigerated wasn’t doing the beer any favors. Though there are exceptions, most beer should be consumed as fresh as possible, especially IPAs and other hoppy beers. Sitting around for a few months shouldn’t ruin a beer, but the taste will start to drop off over time. Being stored cool and at a constant temperature helps maintain freshness. I’m sure the Nelson Imperial IPA was still drinkable, though I’d be willing to bet it wouldn’t have nearly as much of that “powerful hoppy character” Widmer Brothers boasts, the hops would have faded and it would be much more malty and sweet. It certainly wouldn’t be dangerous to drink and shouldn’t be considered “expired”. But chances are had I drank it without knowing how old it was, my perception of Nelson Imperial IPA and Widmer Brothers IPAs in general would go down, causing me to avoid the products in the future. Not all breweries put dates on their bottles, but for those that do it’s a good idea to check out how old a beer is before you buy it, especially if you’re shopping at stores that might not take such good care of their beer. The breweries that do date their bottles often use different formats, this site can be pretty helpful in find and decoding what a date on a given bottle means. I don’t think I had ever had Palate Wrecker before this latest batch was released a few weeks ago – Palate Wrecker is now Green Flash’s Spring Seasonal available in 12oz four packs and 22oz bombers throughout Green Flash’s distribution area – the name always sort of turned me off. I know, don’t judge a book by it’s cover (a beer by it’s name?) but every time I saw Palate Wrecker on draft there were a few other beers I wanted to try also, beers that weren’t close to 10% ABV and didn’t imply that they would wreck my palate, so I opted for others instead. Chuck Silva came up with a new method to make intensely hoppy IPA by performing a double brew to make a single beer. First, there is a single infusion mash and subsequent boil at 65 IBU with Columbus and Centennial hops. Then a second, duplicate mash using the 65 IBU wort instead of water and another 65 IBU boil using the same hop schedule. The result is a higher gravity beer with kettle caramelizing in place of crystal malts, an elevated hop flavor and bitterness that could not be achieved in a single brew. I don’t know of any other beers made like this, maybe they’re out there, but I’ve never heard of them. In the wrong hands a beer like this could turn out pretty bad, but Chuck Silva knows what he’s doing when it comes to stuff like this. So the brewing process is cool, but how’s the beer? Not bad, but not really my thing. There are a lot of people that love this beer, like go crazy for it. I’m not a huge fan of sweeter Double IPAs, and while this one apparently doesn’t use crystal malt there’s plenty of carmelization from the double brew. I’ll drink it, but I probably won’t order a second pint when I’m done. It’s plenty bitter but I don’t pick up much hop flavor, the malty caramel like sweetness and bitterness dominate. I picked up this single 12oz bottle at Bine and Vine for $3.29 (it’s a bit cheaper per bottle if you buy a four pack) and also available in 22oz bottles. South Bay Drugs has reopened as Bine and Vine Bottle Shop at 3334 Adams Ave in Normal Heights. Until they closed early last year, South Bay Drugs was one of the most beloved craft beer shops in all of San Diego despite their inconvenient-for-most-people location just a few miles north of the border in Imperial Beach. Unlike South Bay Drugs, Bine and Vine doesn’t have a pharmacy attached and instead is instead nearly 100 percent focused on quality beverages: craft beer, wine and non-alcoholic beverages, like gourmet soda’s and tea. They’ve been open a few months now, fixing things up and getting the shop setup just they way they want it and just recently officially announced the name of the new shop and started telling all of South Bay Drugs old customers where the new location is. The prices are fair, they’ve got plenty of cold storage and Geoi the owner is a cool guy that knows beer. And if you have out of state friends that are always hounding you to ship them beer, send them to Bine and Vine’s website, they ship to over 30 states.